The display on the iPhone 8 Plus is a 5.5" unit with a 1080p resolution (that's 401ppi). It's a LED-backlit IPS LCD screen with RGB matrix, it supports 3D Touch, and has wide color gamut support like last year's. True Tone is a new addition - it's a white balance adjustment possible via the newly added four-channel ambient light sensor. Once turned on, the True Tone algorithm will correct the screen's white balance according to the ambient light and thus make the picture look its best regardless of the ambient light. That's completely different from the blue-light filter called Night Shift, which reduces the blue colors in the evening hours to help you get a better night's sleep. The color correction coming from the True Tone adjustment is noticeable when you compare a True Tone-enabled iPhone with a non-True Tone one. It's not a big difference, but arguably it's better for both perception and ease on the eyes. But if you don't have a device for comparison, you won't know what's different. We did our measurements on the iPhone 8 Plus screen with True Tone turned on, and we got very accurate hues when it comes to color representation. The screen has an average deltaE of 1.3, while the maximum deviation is at the white hue - 4.3. All measured colors except white are well below deltaE of 4, which means the screen has a close to perfect calibration. Disabling the True Tone adjustment brought the average deltaE up to 2.0, while the white deviation remained the same. As you can see - True Tone or not - the iPhone 8 Plus display is pretty well calibrated and has a flagship-grade color representation. As far as HDR content playback goes, things are a bit complicated. From a purely technical standpoint neither the iPhone 8 or the iPhone 8 Plus have HDR displays. That is to say, they do not cover some of the various color and contrast requirements to be certified for HDR10, Dolby Vision and the like. In contrast, the iPhone X does have official certification. However, on both the iPhone 8 Plus and its little siblings specs pages, Apple clearly states: "Supports Dolby Vision and HDR10 content" under video playback. Apple makes that claim since even without full HDR capabilities, the panels in the iPhone 8 and iPhone 8 Plus do manage to render some of the extended visual features of HDR content. So, it's not exactly certifiable HDR grade quality. Then again, HDR has kind of a broad definition to begin with. The thing that will matter most from a user standpoint is that Apple has already convinced Netflix to grant the two iPhones access to its HDR library. And since it is currently, more or less the definitive source for HDR video, on a practical level, there isn't really much to complain about here. Dragging the brightness slider all the way up allows for a maximum brightness of 530 nits. The black levels are about the average and the iPhone 8 Plus delivered the promised screen contrast of 1300:1. You can achieve an even higher brightness of 620 nits if the phone detects bright sunlight - it's an automatic adjustment to help you see better outdoors. We should mention Apple has buried the auto brightness toggle deep in the accessibility settings so finding it is not easy. By default, the brightness is always on. In our sunlight legibility test the Apple iPhone 8 Plus posted an excellent contrast ratio beating most other LCD panel we have tested to date and on par with quite a few AMOLEDs out there. It matched the iPhone 7, while noticeably improved since the iPhone 7 Plus. The iPhone 8 Plus is equipped with a non-removable Li-Po 2,691 mAh battery, which is about 7% smaller than the one of the iPhone 7 Plus. But there is a new energy-efficient Apple A11 Bionic chip, which combined with the new battery and optimized iOS 11, should offer same battery life as before. 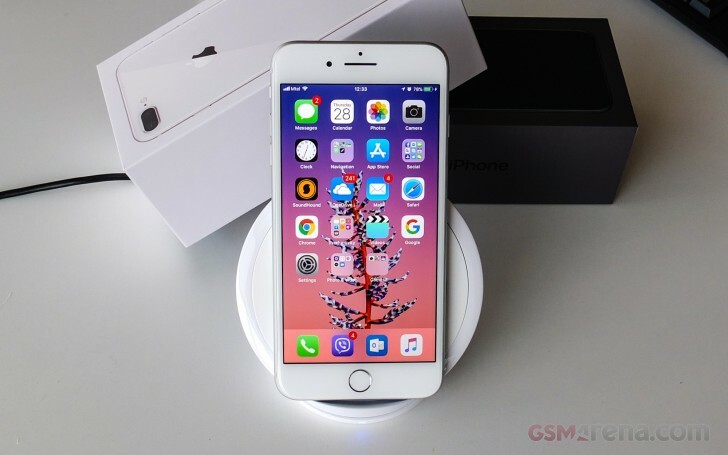 And in case you need your phone by the end of its charge, the Low-Power mode, which you can enable manually, should prolong your iPhone 8 Plus battery life once the charge drops below 20%. The iPhone 8 Plus ships with a regular 5V/1A charger plug that replenish 20% of a dead battery in 30 mins. If you own a 29W MacBook charger, you will be able to fast charge 50% of an empty battery in half an hour. We also tested the iPhone 8 Plus on a Qi-compatible Samsung wireless fast charger - it recharged 17% in 30 mins. The iPhone 8 Plus posted balanced scores across the board - it can do about 17 hours of 3G calls, 12 and a half hours of web browsing on a single charge, or you can watch videos for about 15 hours. The standby endurance turned out above average and thus the very good endurance rating of 81 hours isn't a surprise (a few hours more than the 7 Plus). Our endurance rating estimates how long a single battery charge will last you if you use the iPhone 8 Plus for an hour each of telephony, web browsing, and video playback daily. We've established this usage pattern so our battery results are comparable across devices in the most common day-to-day tasks. The battery testing procedure is described in detail in case you're interested in the nitty-gritties. You can also check out our complete battery test table, where you can see how all of the smartphones we've tested will compare under your own typical use. The Apple iPhone 8 Plus comes with a bunch of wireless connectivity features. Some of the Apple iPhone 8 Plus models come with the latest Qualcomm modem with support for fast LTE Cat. 16 (up to 1Gbps down, 150Mbps up), while others have the latest Intel baseband with LTE Cat. 12 (up to 600Mbps down, 150Mbps up). No matter which model is intended for your market, the LTE will cap at Cat. 12 meaning 600Mbps uplink. Whether this was done for the sake of fairness or not, that's what it is. At least all the models have one of the widest LTE band coverage we've seen. Regular 2G and 3G connectivity are all safely covered as well with a multitude of supported network bands. The iPhone 8 Plus also supports the latest Voice over LTE (VoLTE), HD Voice and Wi-Fi calling protocols, but those are carrier dependent features so not everyone will get to enjoy them. Naturally, the latest Wi-Fi and Bluetooth 5 standards are dully covered. There is also support for NFC and thanks to iOS 11's new Core NFC API, the reader's functionality works for NFC tag reading besides Apple Pay. The iPhone 8 Plus supports reading any NDEF formatted tag but only within an app, which can read and take action. This last requirement makes us doubtful whether this also means the iPhones will now be able to make use of the NFC-assisted pairing to various wireless peripherals and accessories, which Android users have been enjoying for ages. Unfortunately, we didn't have one handy to try it out, but we'll update this section when we grab hold of more info. The iPhone 8 Plus uses a proprietary Lightning connector for wired data transfers, charging, and audio. There is limited USB Host support - you can attach some certified accessories or access your digital camera storage via proprietary adapters sold separately. You can pair a Bluetooth keyboard to the phone should you need this sort of peripheral. Now that there is no 3.5mm audio jack on board the phone, you can use the provided Lightning-to-3.5mm adapter to continue using your favorite pair of wired headphones with the iPhone. Or buy some very expensive inhouse or third-party wireless headphones, if you will. Finally, the iPhone 8 Plus supports wireless charging through every run-of-the-mill Qi-compatible charger. It's refreshing to see Apple comply with an established industry standard for once.